There are several things out there that can make a stand for your iPhone and there are also cases that can clip to your pants, but not many can do both. This iCooly Case does both as well as allows room so that you can comfortably slip your hand between the iPhone and the clip. Which would give you a better grip on things, making this ideal for anyone who is clumsy and terrified of dropping their iPhone. It appears as if it only allows for the iPhone to stand up on end as opposed to on its side. Which would make it so you couldn’t just set it down and watch a video in a wider form. The case comes in three different color variations, one is all white, another all black and lastly one has a black case and a bright red clip. If you were ever worried that your iPhone will stand out too much and therefore get stolen, I’d advise not getting the last one. Hopefully with as chunky as the clip is, it will stay in place well enough within pockets. This is especially great for women, since jeans pockets for women’s jeans are typically shallow. 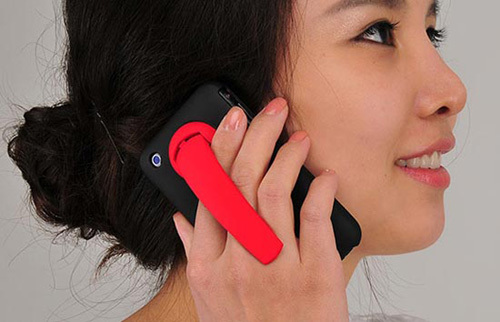 You can pick up the iCooly Clip Stand iPhone Case for 25 Euros. If you think about it, flicking the ‘stand’ out for it to stand vertically would also work for horizontally. if only life came with a handle… then we could all hang on!